Learning new words can’t be simpler! PrepChief is the incredible tool that helps you in preparing for GMAT, GRE, TOEFL, IELTS & CAT . The Vocabulary Preparation App is engaging and interactive to provide you with word pages filled with examples, engaging information, and quizzes for easy learning. 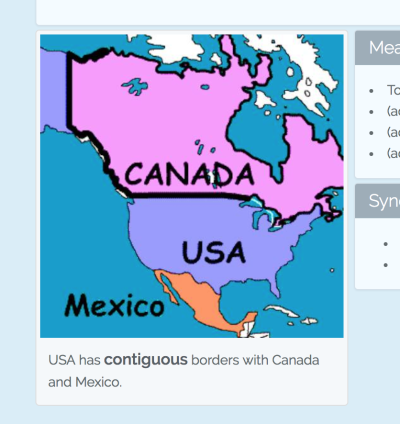 Students can track their progress with Vocabulary Flashcards. The tool perfectly suits your learning pattern with suggested new words. Vocabulary preparation App offers various examples and meanings to help you learn many aspects of a word. Every vocabulary comes with such an amazing picture of word examples to provide an easy and concise understanding. Once you are familiar with a word, vocabulary preparation app will start asking you questions to help you not to forget the learnt word. You can use FlashCards to provide yourself with personalized learning, and even track the progress. The guided and engaging Vocabulary helps students to learn new words and the conscious power to use them correctly. The tool improves their reading comprehension preparation for GMAT, TOEFL or CAT being the best ever simplified learning App. Vocabulary preparation App is an interactive and engaging tool to learn new words with ease. It provides you with interactive and rich word pages garnished with examples and other useful information about the particular word and quizzes. Apart from learning, it helps you to track your learning based on your suggested new words learning pattern. PrepVocab is an App specifically designed to help you prepare for competitive exams such as GMAT, GRE, TOEFL, IELTS & CAT. It equips you with the right words ahead of exams. The learning session is small to enable you taking it twice in a day. Interactive word page comes with concise interesting sections such as meaning, pronunciation, synonym, antonym and examples. Once you become familiar with the word, vocabulary preparation App automatically adds quizzes into your leaning session to enable you to memorize the word well. Track your learning progress and the learned words in the user dashboard. Simply select the exam you are preparing for. PrepVocab currently supports GMAT, GRE, TOEFL, IELETS & CAT. Several examples of pictures are provided to help you learn new words by showing their proper meanings. Learn for as little as 10 minutes a day, but the phonics of learning though little makes it fun, fresh, and focused. Words are arranged according to their level of difficulty to improve your initial learning. You will start with the initial easy words and the level will begin to increase gradually higher. Failure in pronunciation is a learning disaster; therefore Vocabulary Preparation App is the perfect learning tool for improvement on steady pronunciation. Q: Is PrepVocab Free ? Yes PrepVocab is completely free. Q: Why do I need a Vocabulary preparation App? It helps you to learn new words with examples, engaging information, and quizzes to test your learning skill. 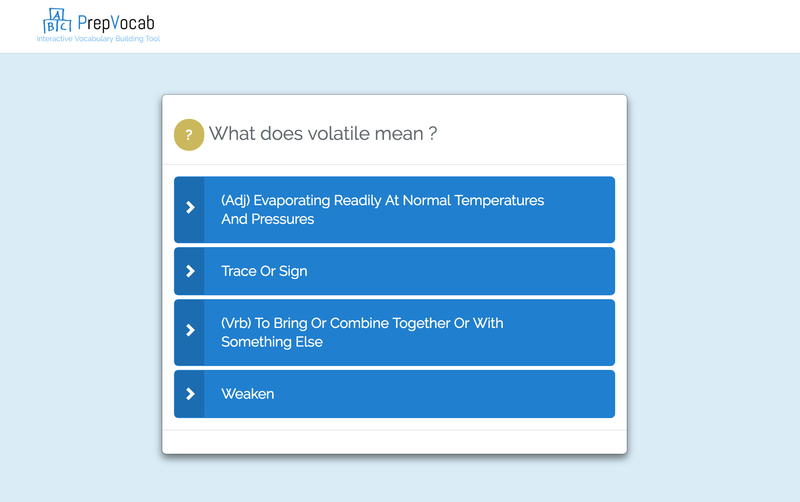 Q: Can I track my word-learning progress with PrepVocab? 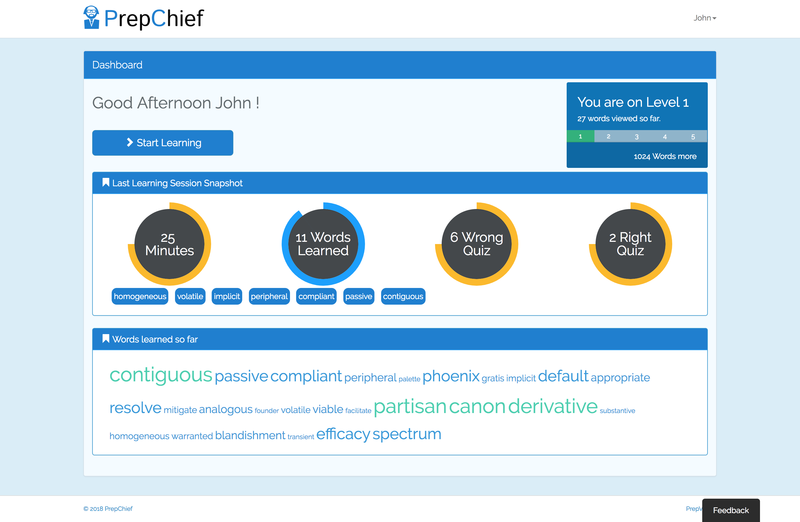 Yes, you can track your word-learning progress and see the learned words in the user dashboard. Q: How many words learning formats does PrepVocab offer students? 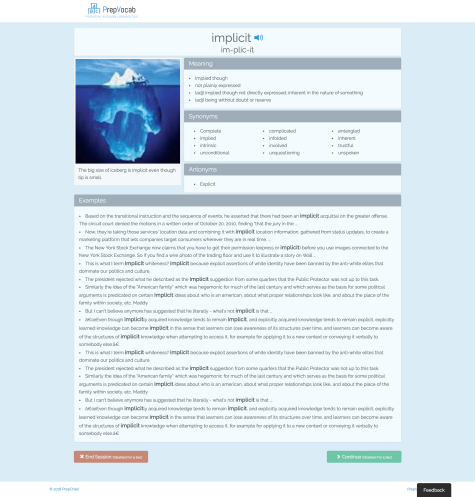 PrepVocab provides you with multiple words learning ways to improve your competence in exams preparations. Yes, In PrepVocab we have curated list of words which appears in GMAT & CAT. Q: Can Vocabulary preparation App help me pass my exams? Absolutely, the app is built to help you prepare for GMAT, CAT, GRE, TOEFL, & IELTS exams respectively and pass with good grades. 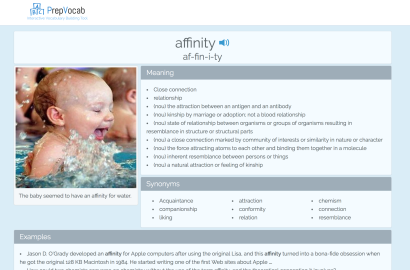 Q: How vocabulary flashcards are useful? Flashcards help you to remember the words you need for learning purpose. They’re your portable reminding tools anywhere, anytime. Does GMAT Test Vocabulary ?